♥ Platform: Nintendo-GBA GBASP GBM NDS. Specifically for the US. This is an official Nintendo product. A low quality battery MIGHT last a few years, while one of these Panasonic batteries can easily last over a decade. Us.because if you aren't happy, we haven't done our job! If it's an error made on your part, or you change your mind, then all. These might. NEW Pokemon Emerald Version Game Boy Advance With case! In new condition, tested works great and saves! 4.5 out of 5 stars - Pokemon: Emerald Authentic. 461 product ratings461 product ratings - Pokemon: Emerald Authentic. POKEMON EMERALD VERSION GAMEBOY ADVANCE GAME GBA REPRODUCTION game . Condition is Brand New. Shipped with USPS First Class Package. 4.5 out of 5 stars - Pokemon Emerald Version Game Boy Advance *New Battery* Authentic Tested & Works! 461 product ratings461 product ratings - Pokemon Emerald Version Game Boy Advance *New Battery* Authentic Tested & Works! Pokemon: Emerald Version (Nintendo Game Boy Advance. Condition is Very Good. Shipped with USPS First Class Package. Game Boy Advance Pokemon Emerald Version Empty Box Only No Game . Pokemon: Emerald Version (Nintendo Game Boy Advance, 2005). Condition is Very Good. Shipped with USPS First Class Package. Pokemon: Emerald Version (Nintendo Game Boy Advance, 2005). Condition is Good. Shipped with USPS First Class Package. -internal battery has run dry so clock-based events won’t happen -save battery still works -AUTHENTIC and RARE thanks! Pokemon: Emerald Version (Nintendo Game Boy Advance, 2005) Box and inserts! NM! 4.5 out of 5 stars - Pokemon: Emerald Version (Nintendo Game Boy Advance, 2005) Box and inserts! NM! 461 product ratings461 product ratings - Pokemon: Emerald Version (Nintendo Game Boy Advance, 2005) Box and inserts! NM! Plays on GBA, GBA SP, and GBM DS only. New reproduction copy with case. Save Works. Not Original and is a really good remake. Pokemon Emerald - GBA (AUTHENTIC) . Condition is Good. Shipped with USPS First Class Package. .
Pokemon: Emerald Version (Nintendo Game Boy Advance, 2005). Condition is Good. Shipped with USPS First Class Package. Pokemon Sapphire Version for the. Pokemon Emerald Version Game Boy Advance Game Tested/works. Possibly a reproduction and not the official Nintendo manufacturing. Condition is good. Shipped with USPS First Class Package. With plastic case. 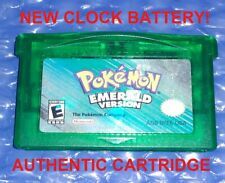 PokemonEmerald Version Nintendo Game Boy Advance Authentic New Battery. Condition is Good. Shipped with USPS First Class Package. POKEMON EMERALD AUTHENTIC All 386 SHINY GAME UNLOCKED & NEW BATTERY! You will start with 0 badges, so you can start your own adventure. Boxes 1-13 are filled with the 386 Shiny Pokemon. These Pokemon work fine with Pokebank. All 386 Shiny Pokémon(in boxes 1-13.). All Pokemon are 100. 4.5 out of 5 stars - POKEMON EMERALD AUTHENTIC All 386 SHINY GAME UNLOCKED & NEW BATTERY! 461 product ratings461 product ratings - POKEMON EMERALD AUTHENTIC All 386 SHINY GAME UNLOCKED & NEW BATTERY! Condition is Good. The label show wear and is missing a piece. Pokemon Emerald Version Game Boy Advance Authentic Tested & Works! Pokemon Emerald Version Game Boy Advance Authentic Tested & Works!. Condition is Very Good. Shipped with UPS Ground. 4.5 out of 5 stars - Pokemon Emerald Version Game Boy Advance Authentic Tested & Works! 461 product ratings461 product ratings - Pokemon Emerald Version Game Boy Advance Authentic Tested & Works! We are very easy going and will work with you. The default option isShiny, but you have a choice between receiving allShiny orNon-Shiny Pokemon. Option 2. All Pokemon. If none are chosen you will start with Torchic Treecko and Mudkip. All Pokemon Are Level 100. GOOD CONDITION - NEW SAVE BATTERY INSTALLED. Pokemon: Emerald Version. Condition is Like New. Just the game, no box. Works perfectly, new battery. We have been collectible toy paleontologists for over 16 years. This is an amazing piece for your collection! Authentic Nintendo. New save battery soldered in. Everything is in good condition. We buy all of our item s used.